2019 brings new ideas, dreams, and aspirations. As designers, we embrace the start of another year as an opportunity to learn and discover changes in the senior housing market. Senior Housing trends continually evolve to meet competitive market demands. Urban locations and integrated wellness design are at the forefront. Technology is shifting the landscape as it brings a host of new health benefits and opportunities to the market. Combined, these variable trends define a new senior living product. Blurring the Lines Between Indoor and Outdoor Spaces… Natural elements flowing indoors creates calming spaces. Nick Bruhn, AIA, Studio Leader for Pi Architects sees this as a significant trend that’s going to continue to take off in 2019. Floor to ceiling windows bring in natural light and landscape close to the building removes the separation between the natural elements and building. Charla Goss, IIDA, Director of Interior Design for Pi Architects, reaffirms this trend stating a rise in demand for bringing live plants back indoors. Biophilic design continues to be a priority for 2019 by allowing natural elements to inform decisions about patterns and shapes. Bringing Back the Classics… Mixing different brick on an exterior creates a modern twist on the traditional brick mercantile building. Pushing new ideas, yet respecting the past, gives way to endless possibilities for the use of this material including vintage postcard inspired hand painted murals on the interior. Mixing of Natural Materials…Interior designers see a rise in the use of natural materials. Tables with marble tops and metal legs add elegance to space. Other decorative accessories in natural materials add interest and help complete designs. For example, the use of a wood mantel on the stone fireplace increases the amount of natural materials adding calmness to the room. Open Floor Concept… Spaces that flow from the kitchen to living room continue to rise in popularity. The open floor plan between spaces makes them feel larger and more inviting. Color and Florals are coming back… After a few years of a lot of gray and white and very neutral interiors, we can look forward to more color. Floral prints are back with an updated look and feel with subtle colors. Gold will play a role in the form of metal but not in paint or fabrics. Painted kitchen cabinets will still be popular but in more than just white. Look for Slate Blues, Deep Greens, and Teals that will still highlight a wood floor but will create a more weighted look. Opportunity for Senior Housing within Mixed-Use Developments… Mixed-use developments are springing up all across the nation. Current tax incentives and market demands now encourage the addition of senior apartments. 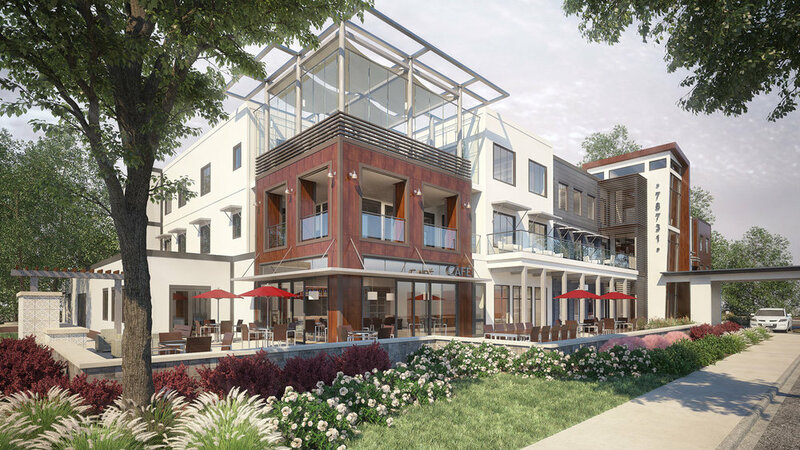 These new developments encourage diversity of age while keeping seniors engaged in the full community Residents feel like they are downtown as they take a stroll to grab a hot beverage with friends or enjoy a shopping trip right out their front door. Smaller Sites = Greater Density… With the increase of the mixed-use urban developments, sites become smaller, and population density goes up. The need for quiet outdoor havens arises as people live in tighter proximity. Bryan Warne, PLA, Director of Landscape Architecture states that especially in denser urban environments, a well-planned landscape is an essential element for the quality of life and improves street side market appeal. Wellness… the word that’s taking off like wildfire across senior living providers. In the past, senior living communities focused primarily on care and placed a low priority on wellness. This trend is beginning to reverse itself according to a recent article published by ICCA. Wellness now is becoming the primary focus of providers with care as an option. Wellness is expanding from physical activity to the whole person. One of the added benefits of wellness is that it helps to combat depression often faced by seniors. Intentionally designing spaces that uphold all Dimensions of Wellness will be a high priority in 2019. Active Lifestyle… People are continuing to live active lifestyles far later in life. As a result, they are demanding high impact spaces to keep up with their routines. Areas that allow for a variety of activities such as happy hour, bocce ball, grilling, or sitting by the fire with a glass of wine bring together great options for residents. Tunable White Lighting… LED lighting that's connected to a computer is programmed to change the color of the light throughout the day results in improved circadian rhythm for residents. It’s also possible to manually program the light and temperature to the resident’s preference. Learn more from Philips Lighting. 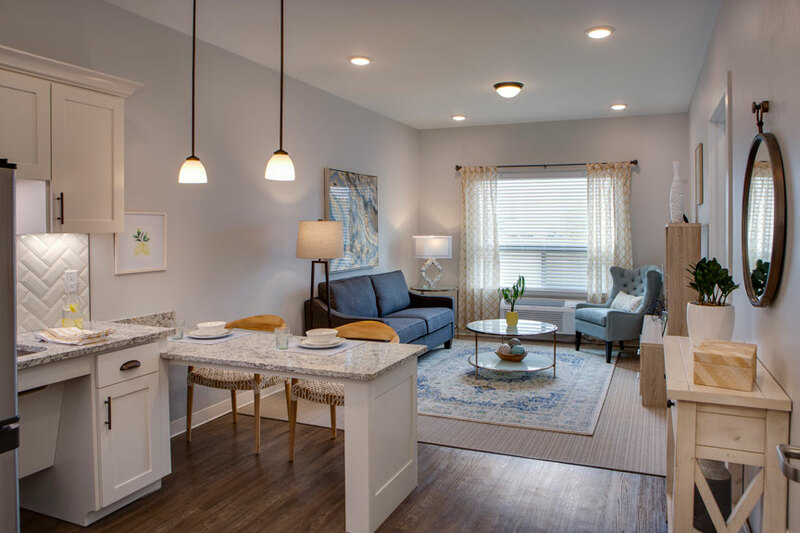 Smart Home Integration… Technology such as Alexa, programmed lights, and thermostat with voice control are coming together to change the senior living infrastructure as we know it. Health care is stepping up its game as apps and smart devices improve diagnostics and variability of treatment options. It’s exciting to imagine how the coming year will shape senior housing. Trends will continue to adapt and change to meet market demands. Our team at Pi Architects looks forward to embracing the design opportunities of 2019!